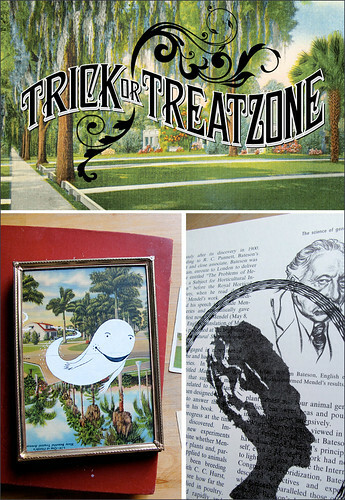 The Trick-or-Treatzone show just opened (reception Friday, 10/23) at the Curiosity Shoppe. The work is all Halloween-inspired and includes: a series of limited edition gocco prints on vintage textbook pages called “My Favorite Monster”, featuring silhouettes of the likes of Wolfman, Nosferatu, Godzilla, Frankenstein (or Frank, as they call him), and his Bride; “Ghosts of Our Past”, a collection of paintings featuring charming and mischievous ghosts on vintage postcards in vintage frames; and “Autumn’s Epigrams”, a collection of somewhat chilling phrases printed on assorted patterned papers. Plus, two large ink and watercolor illustrations installed in the shoppe’s windows: “Giant Monster Takes San Francisco”, and the Ed Emberley-inspired “How To Draw A Pirate Cat in 6 Easy Steps”. yay Treatzone. I love Halloween (I’m craving peanut M&M’s as we speak)!